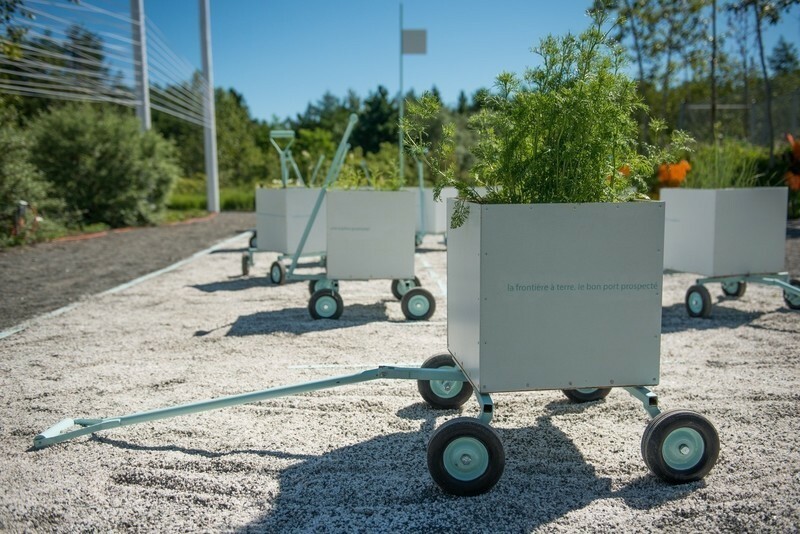 Twenty-six gardens will be on view this summer at the 17th edition of the International Garden Festival. 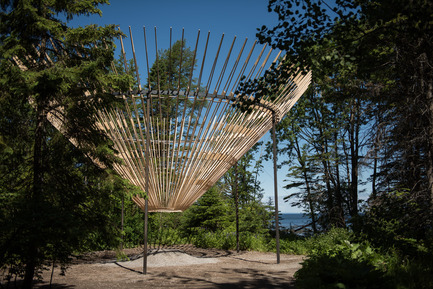 Five new creations by designers from Canada, the United States, France and Switzerland will join the temporary installations on view and a sixth will be exhibited at special events throughout the summer. 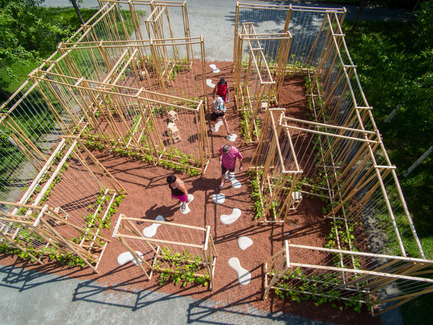 The International Garden Festival invites visitors to explore twenty-six interactive garden installations created by seventy-two landscape architects, architects, designers and visual artists from nine countries. For the 17th edition, five new creations by designers from Canada, the United States, France and Switzerland will join the temporary installations on view and a sixth will be exhibited at special events throughout the summer. 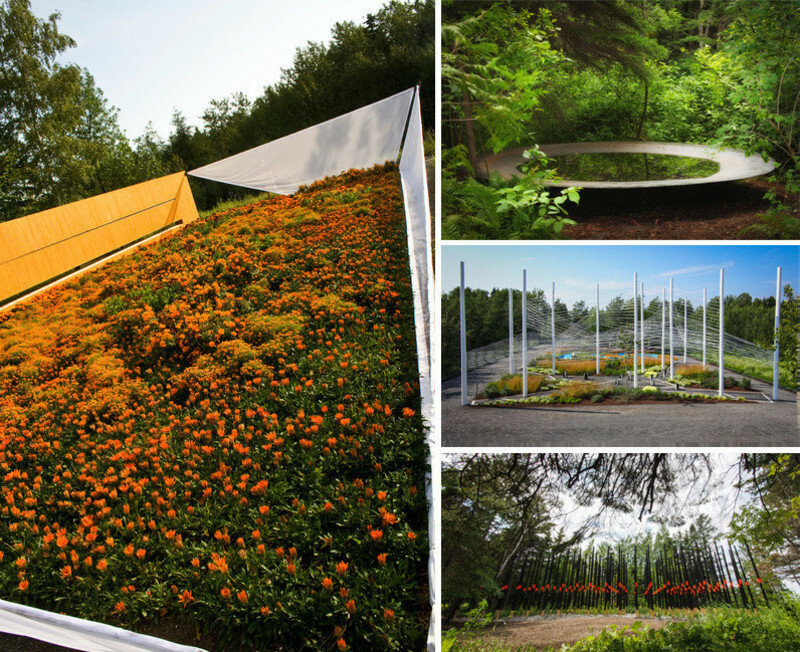 Five new gardens of the 2016 edition of the Festival were selected by the jury from 203 projects submitted from 31 countries for the annual competition. 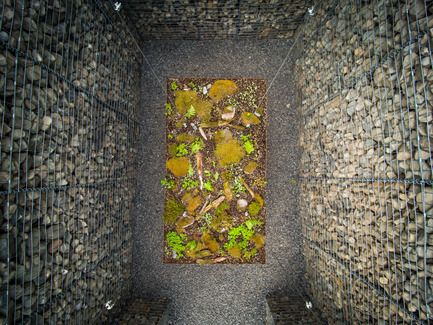 LE CAVEAU is a complex construction made of stone gabions that support a levitating green platform. 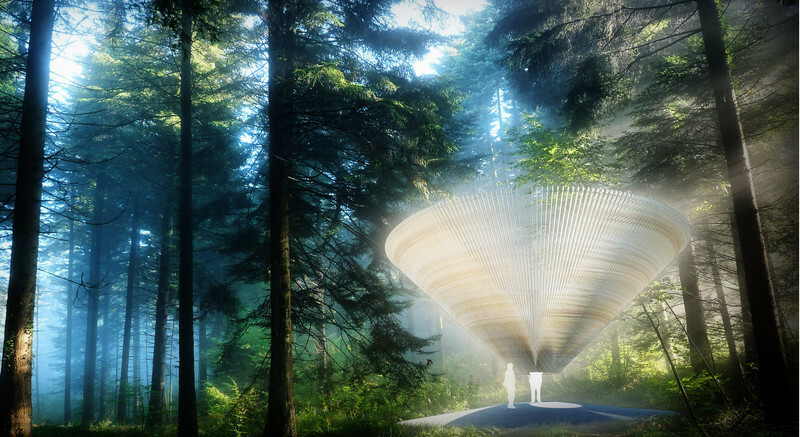 CYCLOPS is gargantuan cone 8 metres in diameter suspended over the forest floor. 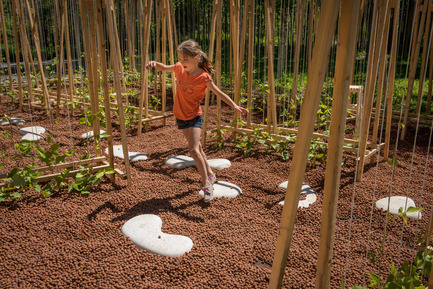 The MAISON DE JACQUES provides a happy home to a forest of beans where children can play hide-and-seek in one of many secret gardens. 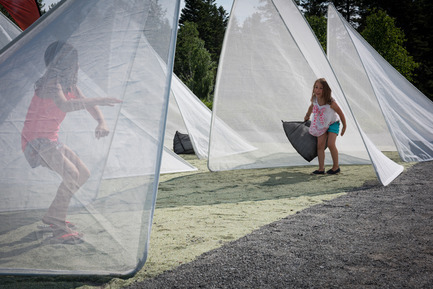 In TiiLT, 24 tents populate a space like a school of fish or a flock of birds. 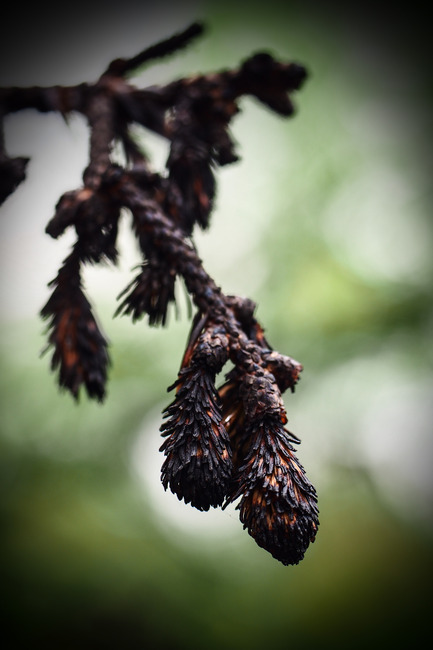 CARBONE offers a charred tree trunk, capturing carbon during its entire life and contributing to the renaissance of the forest. 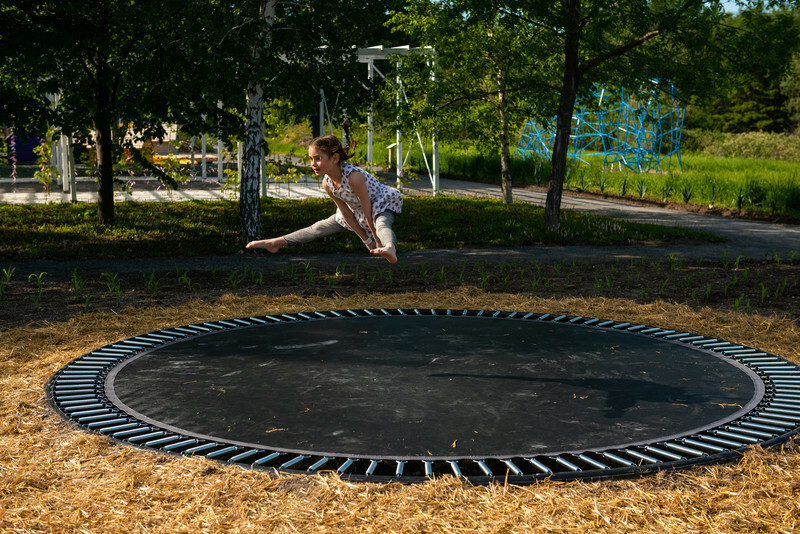 These new installations create new experiences and environments to add to those of past editions. 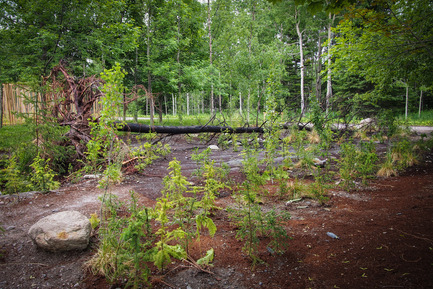 Visitors can explore the environment and experience the joy of moving mature trees along a hidden rail in I LIKE TO MOVE IT or admire the movement created by the wind from within the black and white bands of LINE GARDEN. 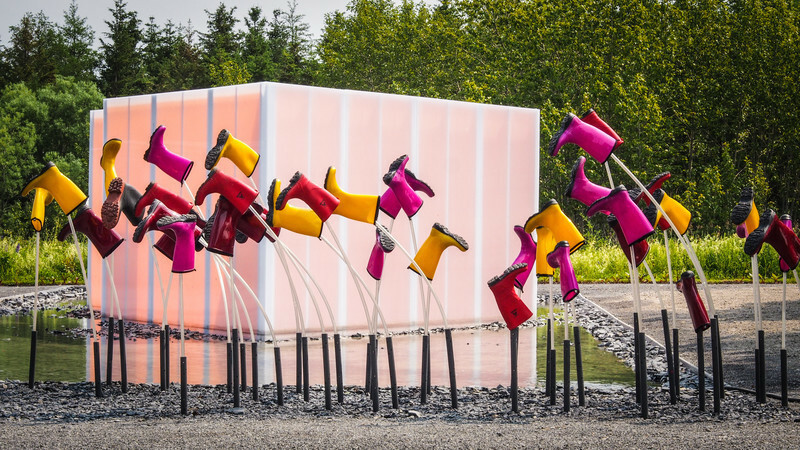 The pure white walls of COURTESY OF NATURE reveal the hidden artistic genius of nature while SE MOUILLER (LA BELLE ÉCHAPPÉE) invites visitors to don a pair of colourful rubber boots to muck it up for themselves among the floating aquatic plants. 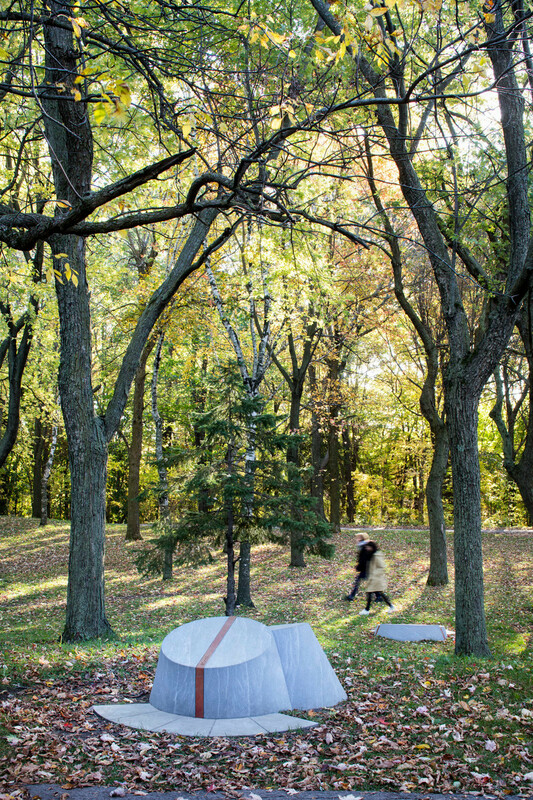 The whistling white ribbons in LE BON ARBRE AU BON ENDROIT link a forest of hydro poles to teach about planting the right tree in the right place and provide a welcome perch to a resident flock of turkey vultures who have adopted them for their morning outing. A sixth new garden, DRESS UP!, will be on view as a participatory event throughout the summer where visitors become the garden by donning one of colourful capes. Special events include the annual fundraising dinner in aid of the Festival in the potager on August 5 and a series of events to launch Experimenting Landscapes Testing the Limits of the Garden, a new book by Emily Waugh on the Festival to be published by Birkhäuser in September. LE CAVEAU by Christian Poules, architect and landscape architect, Basle, Switzerland. The growing plane is shrouded in the intimacy of Le Caveau - a simple room of stone and earth. It is a room for reflection. It is a room for dreamers. Just as the plane levitates before us, we are held in the balance of the stone and life itself. The personification of our own imagination is suspended in time. The primitive plane symbolizes a beginning, while the seeds and the soil form the tilted horizon between earth and sky. The beauty of the garden is found in the simplicity and contradiction of material, light, time and space. It is a shelter for meditation and a canvas for nature. In Le caveau, vastness is held behind its ramparts. 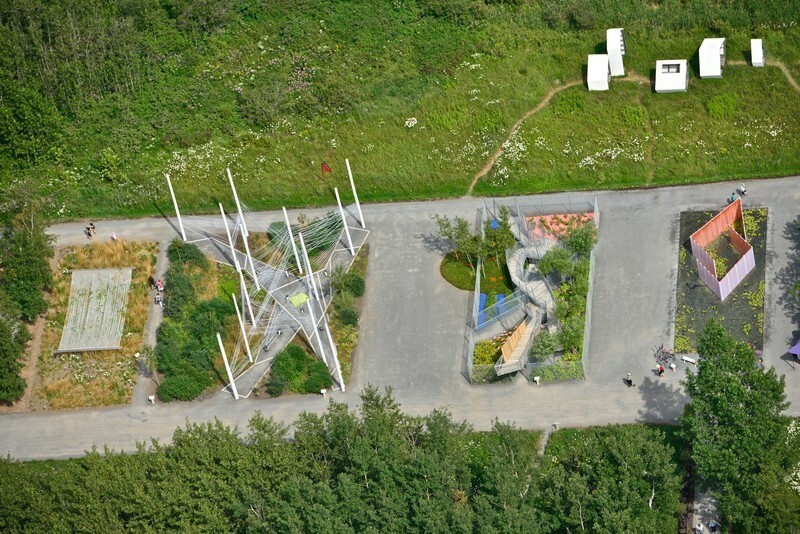 Christian Poules is both an architect and landscape architect who constructs poetic places in the balance of the two disciplines. Practicing outside of fad or style, he is concerned only with the development of the common ground between human sensory experience and natural phenomena. Nature, alone, is his muse and in her realm his work manifests care and understanding of the ephemeral and temporal qualities of space. CYCLOPS by Craig Chapple, architect, Phoenix, Arizona, USA. 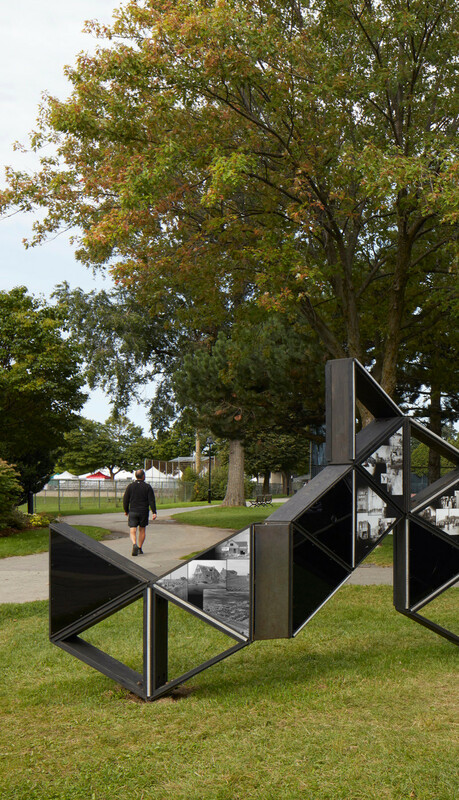 Cyclops is a singular object on the landscape as well as a singular frame of the landscape. It is made up of 100 8-meter long tapering timber planks held in the shape of an inverted cone around a central opening for the user to occupy. These planks are fastened to each other at the innermost diameter and held upright by a 150 mm steel ring beam at the outer diameter. At first approach, Cyclops is an object on the landscape, seen as a clear, platonic form. Through its transparency and porosity, however, it is an object that is also dynamic and changing, blending with the environment. 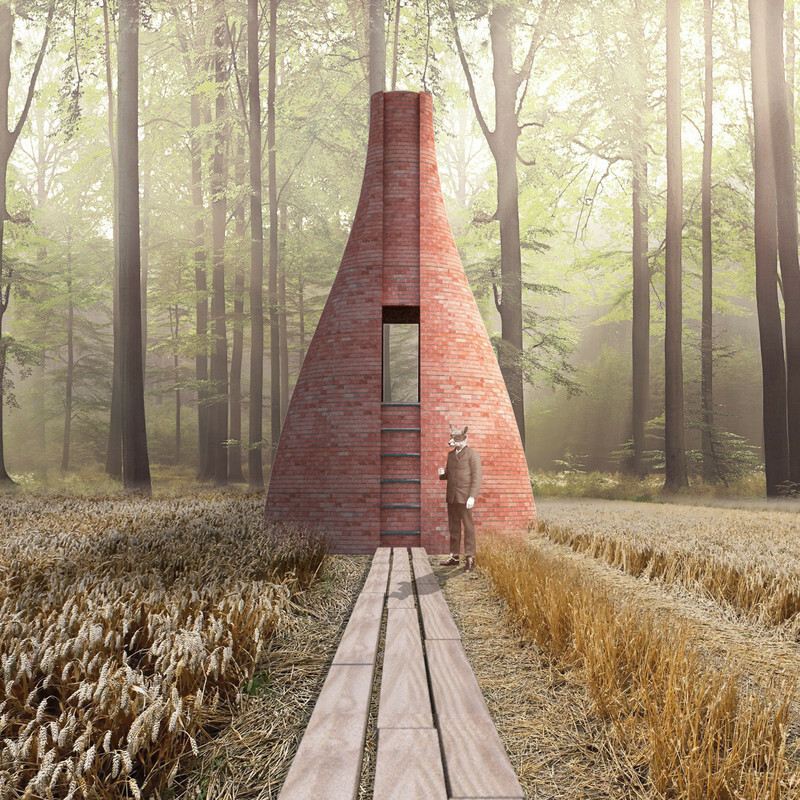 By entering the central 1.5 m opening at the bottom of the cone, the user enters into a different relationship with the object and the landscape. By experiencing it from the inside-out, the object acts to frame the surrounding landscape and sky for the viewer in this same dynamic, temporal way by blending the man-made, platonic clarity of the frame with the organic and natural. The viewer plays the central role of the work in rediscovering the relationship between the object, the frame, and the natural landscape. 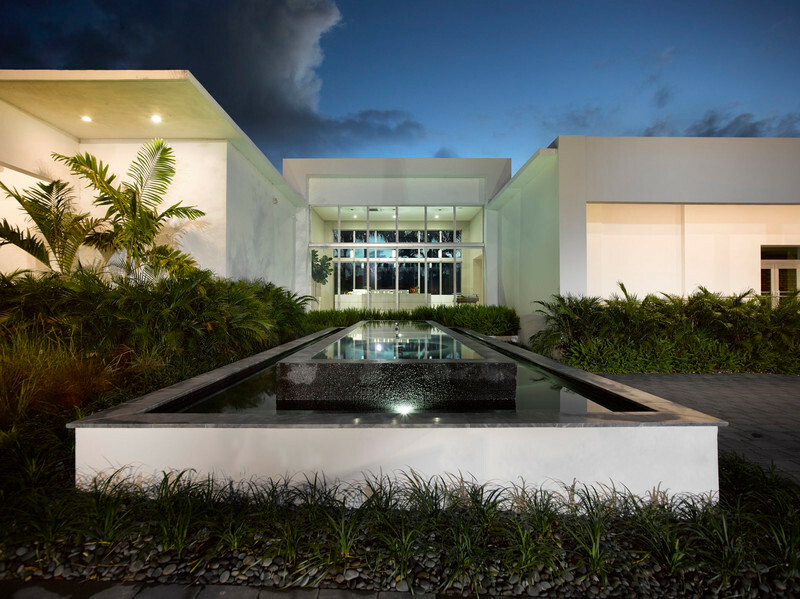 Formally trained as an architect at Yale University but with a deep commitment to creating art, Craig Chapple has pursued both architecture and the visual arts simultaneously throughout his career. 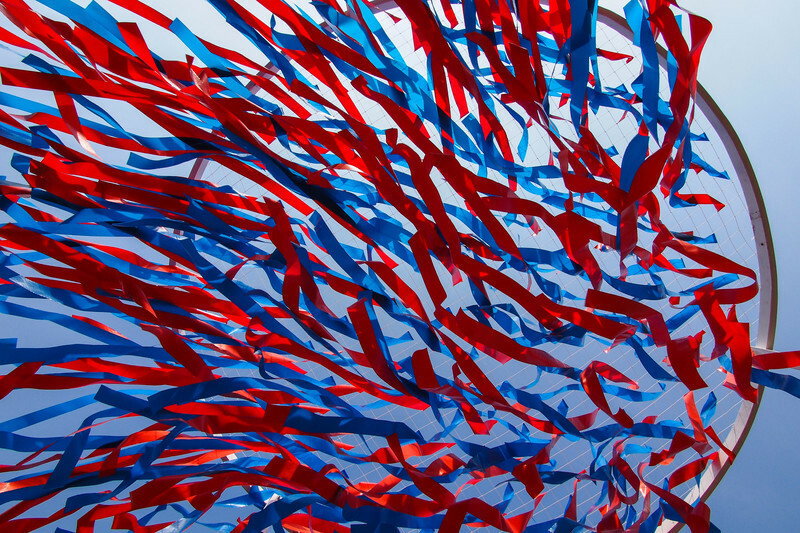 Craig’s work is born from the synergy of these two disciplines, producing work that focuses on the overlap of line, pattern, texture, and process. He works in analog and digital practices in drawing, painting, and sculpture. 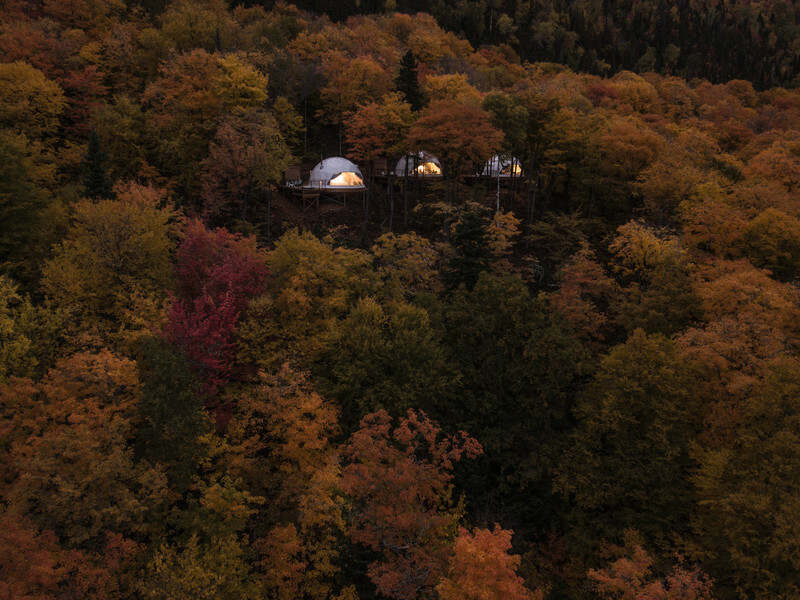 LA MAISON DE JACQUES by Romy Brosseau, Rosemarie Faille-Faubert, Émilie Gagné-Loranger, architectural interns, Quebec City (Québec) Canada. La Maison de Jacques is magical. It will be built over several weeks, starting with the seedlings in May that will grow to be more than three metres in height in a short time. 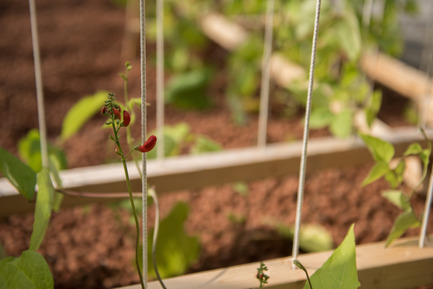 Their clumps of red flowers will be in bloom by the end of July and then the beans will form to bring a taste of goodness to everyone. 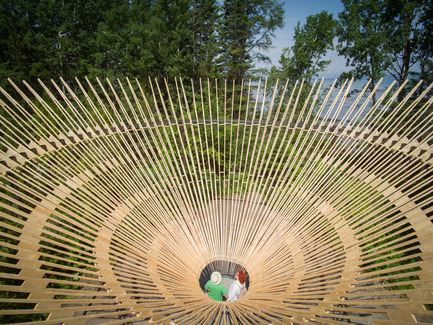 Graduates in the master’s program in architecture at the Université Laval in Quebec City, the designers are working together for the first time on this project to bring their personal interests to life. Romy Brosseau is interested in the relation between the natural and the artificial environment and the interaction between the two. With her various projects, she tries to remove the barriers between architecture and landscape and think of the limit as a space. 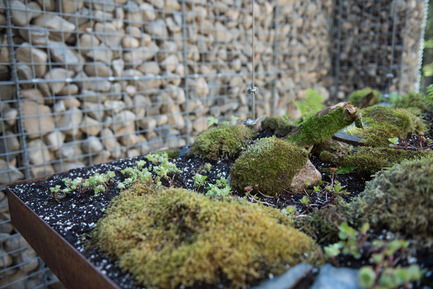 Rosemarie Faille-Faubert is passionate about the discovery of landscape. She explores the different scales, the tactile, the visual, sounds and smells. 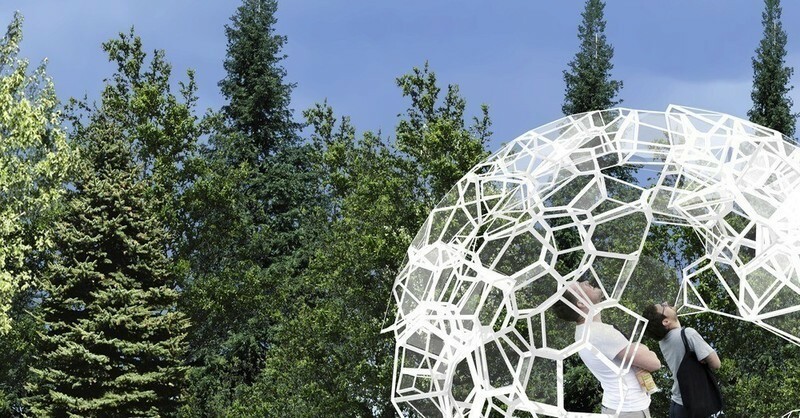 With her projects she strives to redefine the relationship between humans and their environment through architecture. 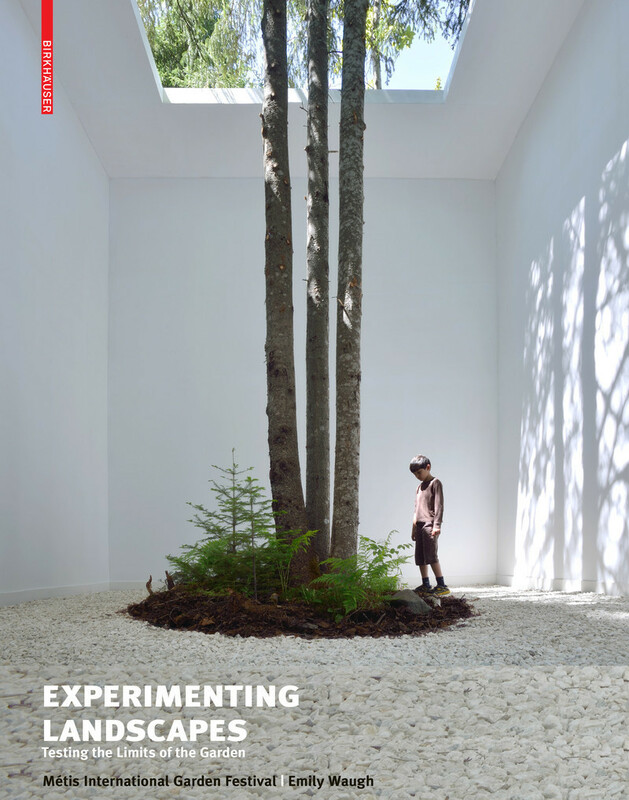 Émilie Gagné-Loranger seeks to reveal some new poetry from her research on interior spaces. Her projects explore the limits, feelings and aspects of intimate spaces. 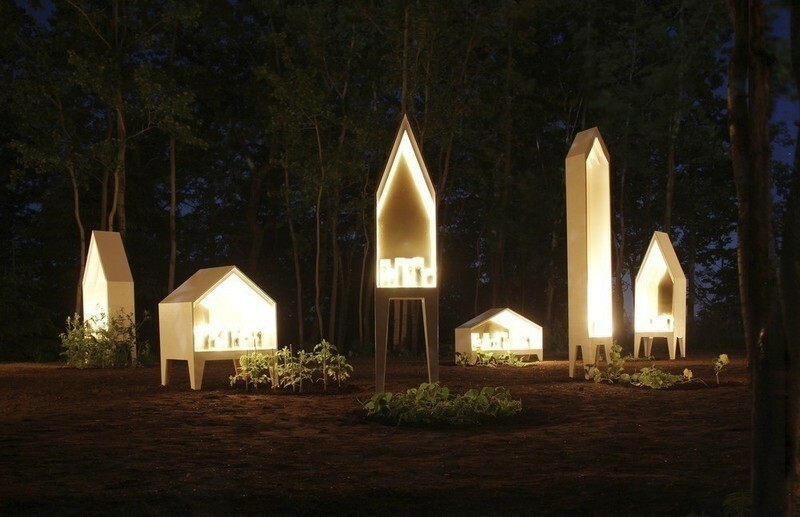 TiiLT by SRCW [Sean Radford, architect, Chris Wiebe, designer], Winnipeg (Manitoba) Canada. 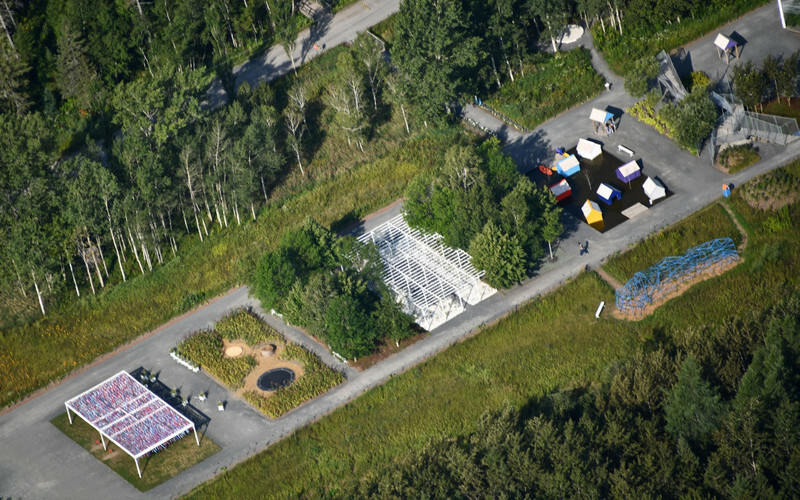 Finding roots in the formal geometries of the labyrinth and the many informal camping traditions in the Canadian landscape, TiiLT is a transformable and inhabitable place for visitors to act, or to idle, however they may be inclined. 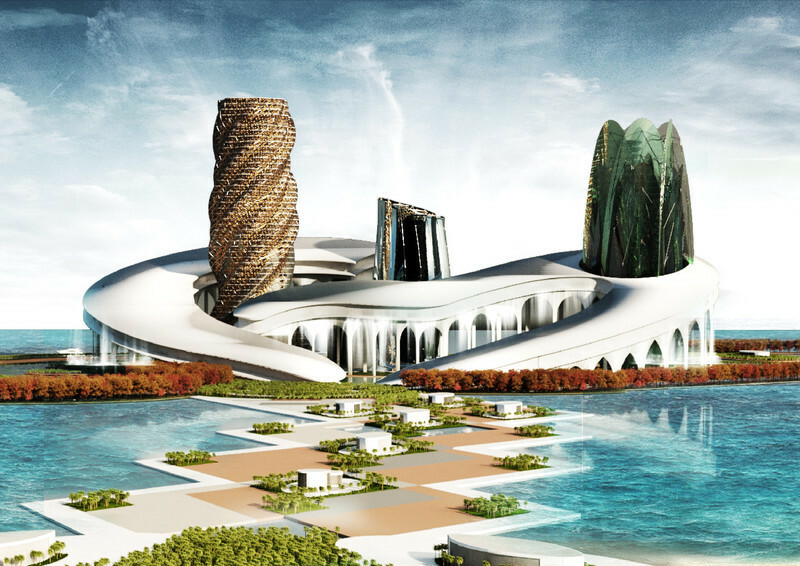 Each structure may be flipped between two orientations, responding to the position of the sun, offering alternating views and shifting pathways through the site. The toggling movement conjures a school of fish, or a flock of birds, flitting in opposite directions yet connected as a whole. 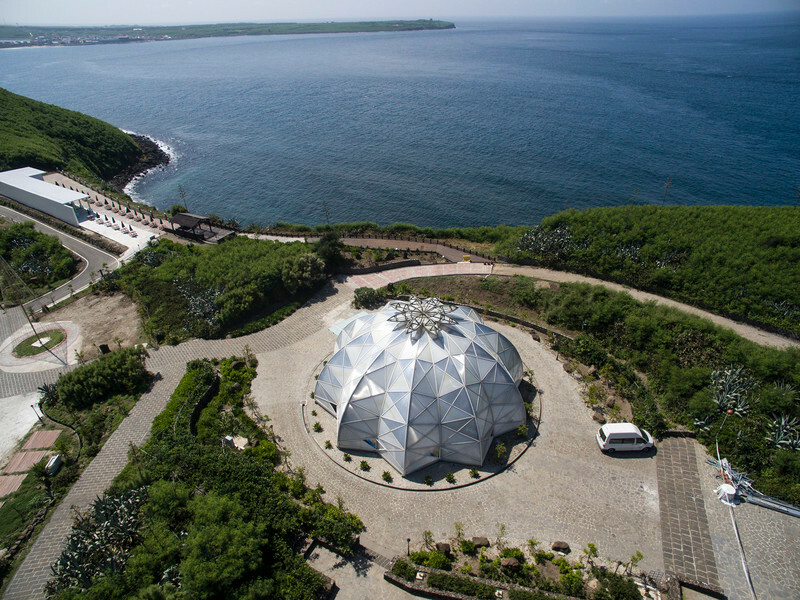 The straw-like lightness of the structures and the white skin recall a field of floral blooms, contrasting the surrounding green landscape and blue sky. 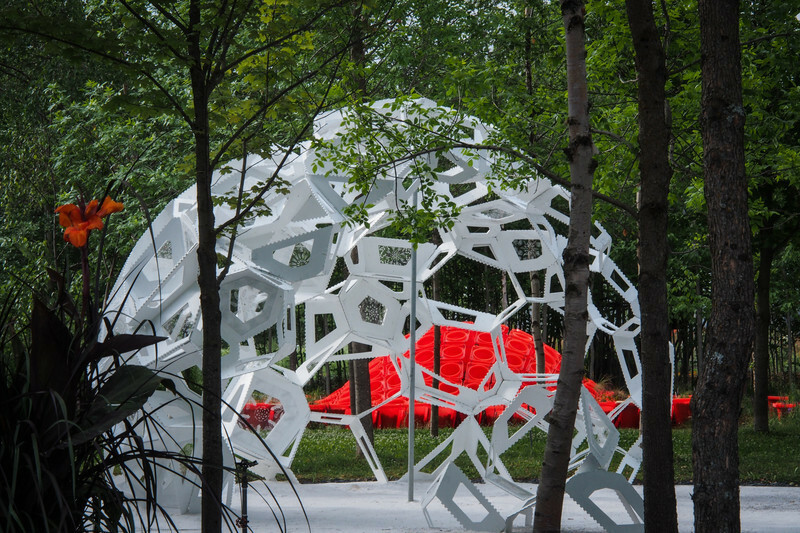 TiiLT challenges the notion of the garden in creating an interactive environment that is part sculpture and part landscape - to evoke a sense of place and beauty from modest elements. 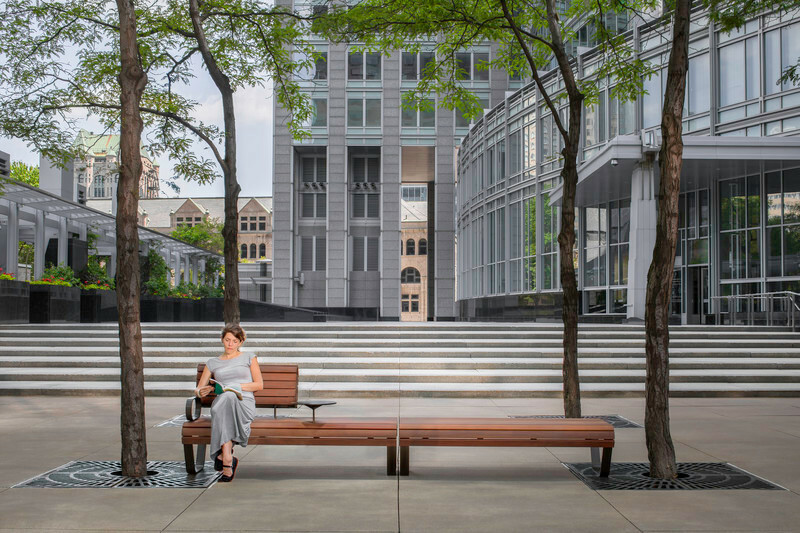 TiiLT provides simple, intimate, shaded spaces in congregation, retrieving memories of long days in short seasons, time spent alone and among neighbours, embracing the feeling of shared disconnection, together. 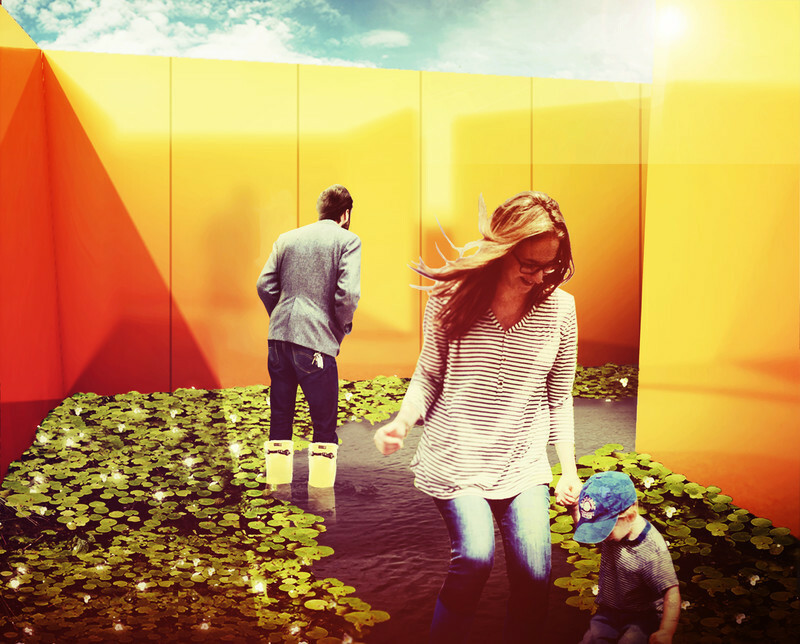 Sean Radford and Chris Wiebe (SRCW) are designers active in the Winnipeg architecture community. SRCW regards the built form as an instigator of ideas, a generator for reinterpretation of the phenomena of everyday experience. SRCW is interested in challenging conventional engagement of form and space, with the goal of inducing pause, inspiring reaction, and inciting response. SRCW’s unconventional use of everyday objects as sculptural materials seeks to create accessibility through familiarity, drawing upon shared experience in the user to evoke delight and excitement. 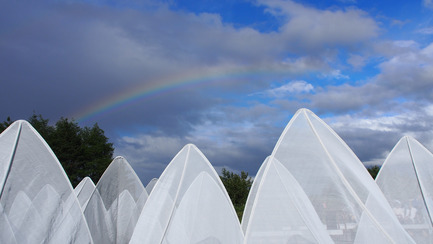 SRCW regards the art of the garden as the creation of an interactive sensory environment, to be fully inhabited in moments of discovery and revelation. CARBONE by Coache Lacaille Paysagistes (Maxime Coache, landscape architect, Victor Lacaille, landscape architect and Luc Dallanora, landscape architect), Nantes, France. The garden is an artifice and leaves many traces. The Earth is a garden. Farming, industry, the internet all leave their mark. Since the dawn of time, nature is altered. The gardener is the one with the restorative power. A gesture of kindness. 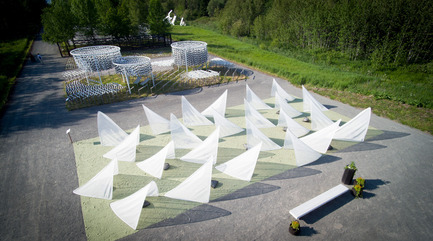 This installation evokes the cycle of production as a parallel to the carbon cycle. The garden landscaped or the landscape gardened. 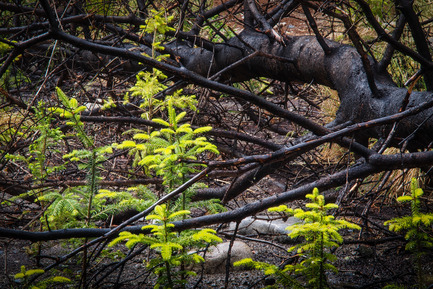 Regenerating the forest and sowing where we have harvested brings nature back to life. Transmit the love of landscape to those who will outlive us. A noble and familiar material, wood is our crib, our bed, our coffin. Cut a tree, remove it from the forest, in itself a vast garden, is the fruit of our labour. It is the result of the work of those who came before us, who planted a seed and provide us today with the wood that gives us rest. A sculpted tree trunk, partially cut into pieces helps to illustrate the primary material used to build furniture. 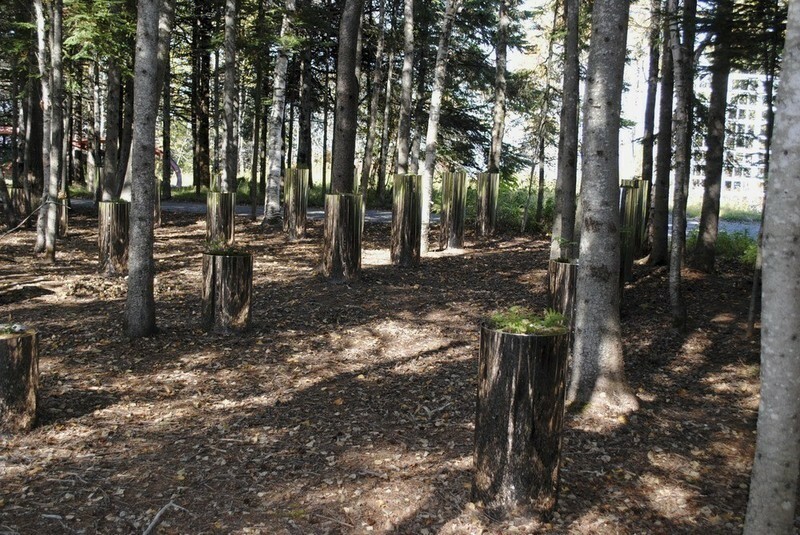 A stump and its roots, a tree trunk cut into parts and modules made of timber, some lightly burned on the surface. A young tree grows where the tree might have grown tall had the tree not fallen. Coache Lacaille Paysagistes was created in 2013 by Maxime Coache and Victor Lacaille. Luc Dallanora joined this duo in 2015. They are all graduates of the École nationale supérieure de la nature et du paysage de Blois in France. 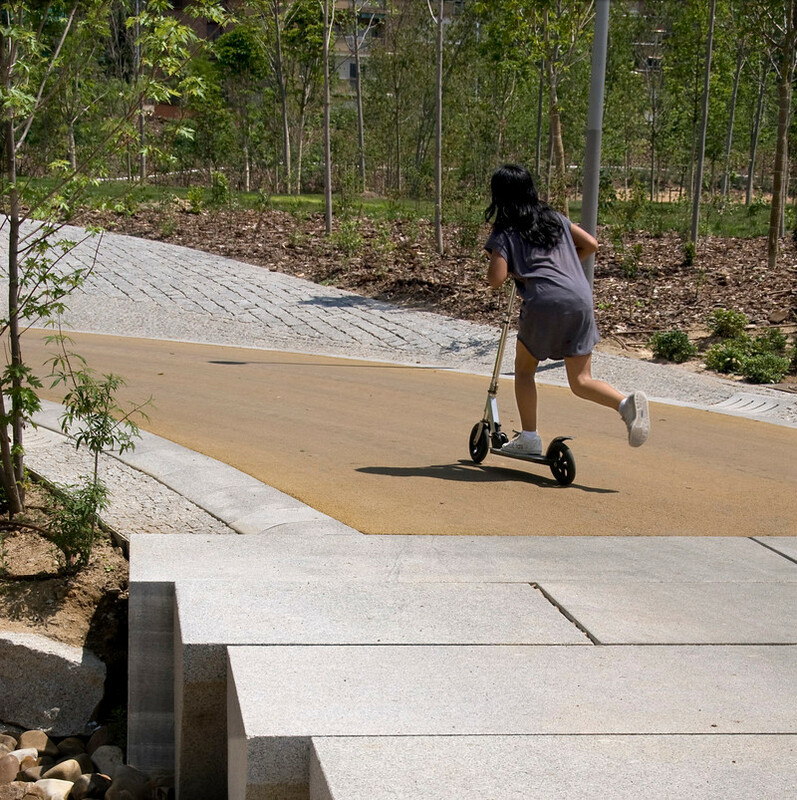 The primary interest of this trio of landscape architects is the landscape. If their knowledge requires creativity, they are also artists. 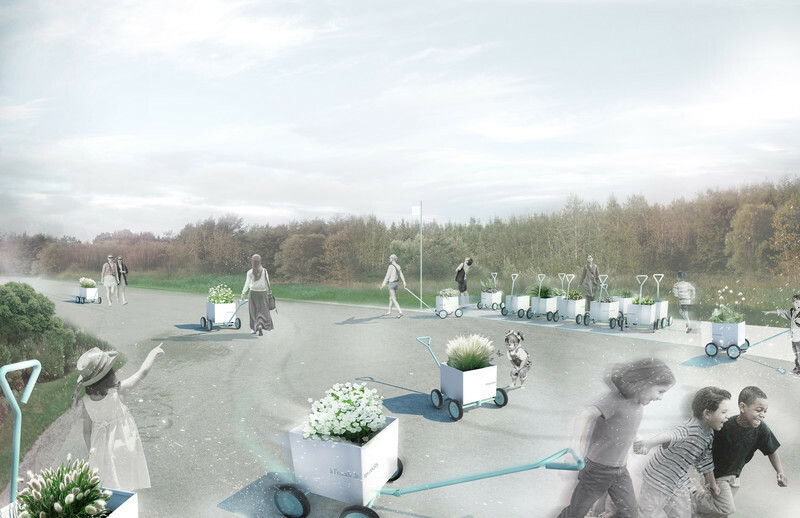 Their role is somewhere between the gardener, the designer, the architect and the urban planner. Each new project is inspired by the context and by those for whom the project is intended to be used; it is also the pretext for new experiments. A special mention was made by the jury to DRESS UP! by Ran Hwang, artist, Sangmok Kim, architect, Sungwoo Kim, architect, Shin Hee Park, fashion designers from Seoul, South Korea / Beijing, China / New York, USA. 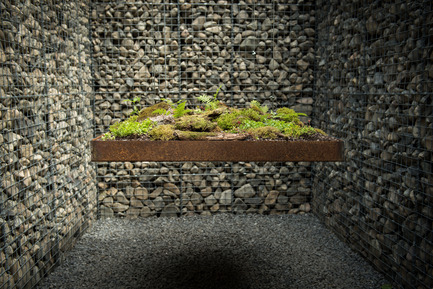 The garden will be presented at special events throughout the summer. 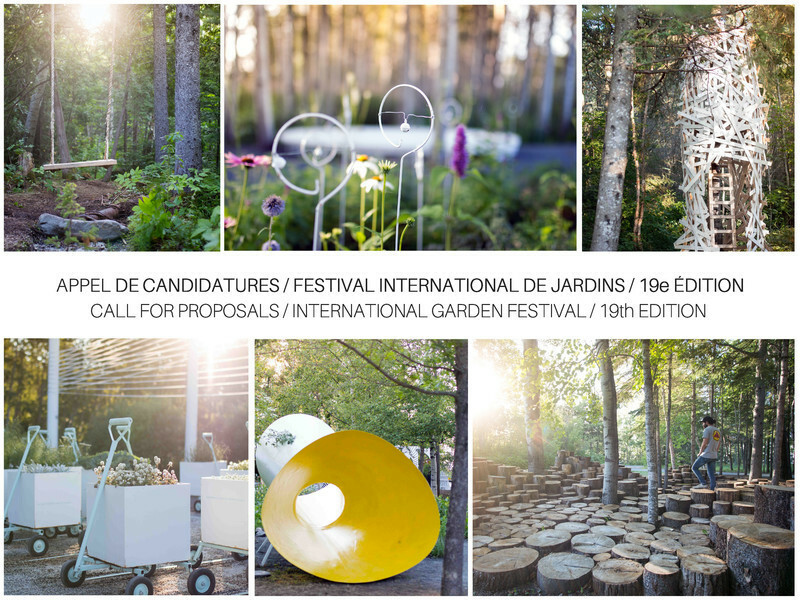 The International Garden Festival is presented with the financial assistance of many public and private partners: Canada Council for the Arts, Canadian Heritage, Canada Summer Jobs, Conseil des arts et des lettres du Québec and Emploi-Québec. 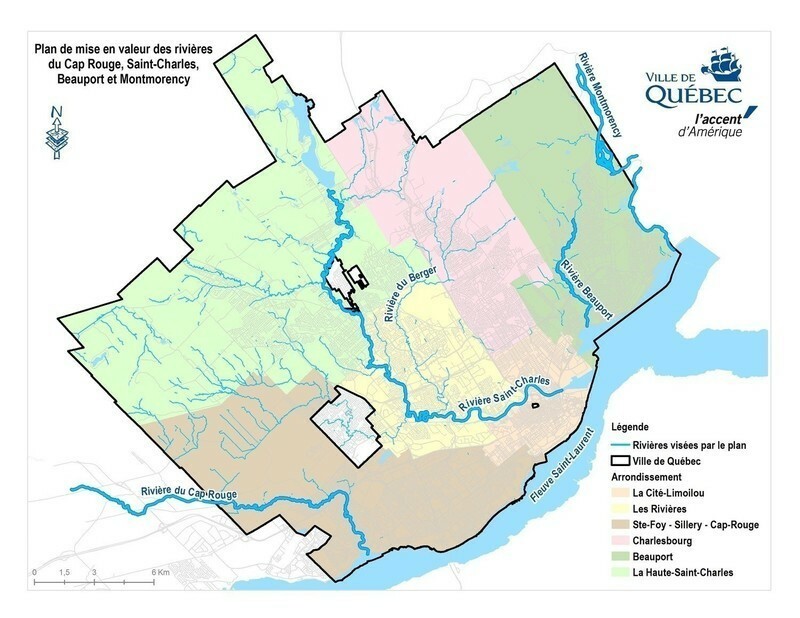 Hydro-Québec has been the lead sponsor of the Reford Gardens since 1999. 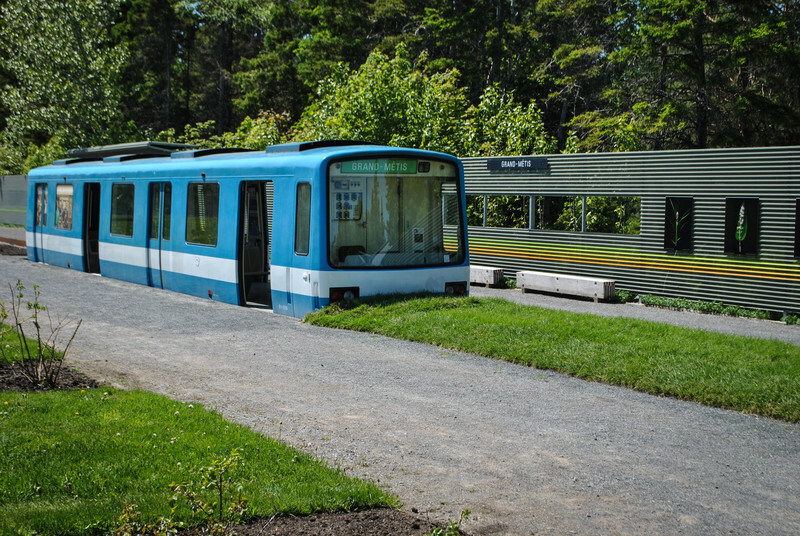 A National Historic Site and Québec heritage site, the Reford Gardens / Jardins de Métis are an obligatory stop for all those visiting eastern Québec. 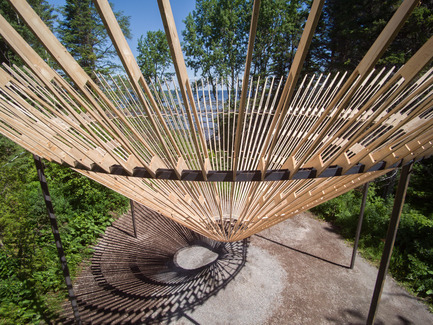 Cultural space and tourist destination for over 50 years, the Reford Gardens is one of the most popular attractions in the Gaspésie region, providing visitors with experiences for every sense. Located on the banks of the St. Lawrence and Mitis rivers, they were created between 1926 and 1958 by avid gardener and plant collector, Elsie Reford. The Gardens are open every day until October 2, 2016. Children 13 and under are admitted free of charge. Season’s Passes are available.